Gulammohammed Sheikh has played a pioneering role in contemporary Indian art's engagement with hybridity and a plural inheritance. Resolutely attentive to the multiplicity of experience and systems of representation and belief on the subcontinent, Sheikh's art has reimagined relationships with the often paradoxical nature of tradition. In a practice stretching more than five decades and across painting and digital media, Sheikh has sought to articulate a way of incorporating his fascination with historical figures and sources stretching from Italy to China in an encyclopedic endeavor, producing contemporary art that unashamedly declares its affiliations to earlier ways of seeing, thinking, and doing. 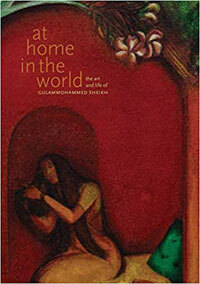 At Home in the World presents the first comprehensive study of the art and life of this seminal figure, bringing together aspects of biographical discussion alongside other modes of art historical analysis. Besides the monographic text by Chaitanya Sambrani on Sheikh's life and work, the book contains essays on specific aspects of his art practice by Coilin Parsons, Marcia Kupfer, and Karin Zitzewitz. Chaitanya Sambrani is an art historian and curator specializing in modernist and contemporary art in Asia. He teaches at the Australian National University, Canberra.